"NES" redirects here. For other uses, see NES (disambiguation). "Family Computer" redirects here. For the 1977 VideoBrain product, see VideoBrain Family Computer. The Nintendo Entertainment System (or NES for short) is an 8-bit home video game console developed and manufactured by Nintendo. It is a remodeled export version of the company's Family Computer[a] (FC) platform in Japan, also known as the Famicom[b] for short, which launched on July 15, 1983. The NES was launched through test markets in New York City and Los Angeles in 1985, before being given a wide release in the rest of North America and parts of Europe in 1986, followed by Australia and other European countries in 1987. Brazil saw only unlicensed clones until the official local release in 1993. In South Korea, it was packaged as the Hyundai Comboy[c] and distributed by SK Hynix which then was known as Hyundai Electronics; the Comboy was released in 1989. The best-selling gaming console of its time,e[›] the NES helped revitalize the US video game industry following the North American video game crash of 1983. With the NES, Nintendo introduced a now-standard business model of licensing third-party developers, authorizing them to produce and distribute titles for Nintendo's platform. It was succeeded by the Super Nintendo Entertainment System. Following a series of arcade game successes in the early 1980s, Nintendo made plans to create a cartridge-based console called the Famicom, which is short for Family Computer. Masayuki Uemura designed the system. Original plans called for an advanced 16-bit system which would function as a full-fledged computer with a keyboard and floppy disk drive, but Nintendo president Hiroshi Yamauchi rejected this and instead decided to go for a cheaper, more conventional cartridge-based game console as he believed that features such as keyboards and disks were intimidating to non-technophiles. A test model was constructed in October 1982 to verify the functionality of the hardware, after which work began on programming tools. Because 65xx CPUs had not been manufactured or sold in Japan up to that time, no cross-development software was available and it had to be produced from scratch. Early Famicom games were written on a system that ran on an NEC PC-8001 computer and LEDs on a grid were used with a digitizer to design graphics as no software design tools for this purpose existed at that time. The code name for the project was "GameCom", but Masayuki Uemura's wife proposed the name "Famicom", arguing that "In Japan, 'pasokon' is used to mean a personal computer, but it is neither a home or personal computer. Perhaps we could say it is a family computer." Meanwhile, Hiroshi Yamauchi decided that the console should use a red and white theme after seeing a billboard for DX Antenna which used those colors. During the creation of the Famicom, the ColecoVision, a video game console made by Coleco to compete against Atari's Atari 2600 Game system in The United States, was a huge influence. Takao Sawano, chief manager of the project, brought a ColecoVision home to his family, who were impressed by the system's capability to produce smooth graphics at the time, which contrasted with the flickering and slowdown commonly seen on Atari 2600 games. Uemura, head of Famicom development, stated that the ColecoVision set the bar that influenced how he would approach the creation of the Famicom. Original plans called for the Famicom's cartridges to be the size of a cassette tape, but ultimately they ended up being twice as big. Careful design attention was paid to the cartridge connectors since loose and faulty connections often plagued arcade machines. As it necessitated taking 60 connection lines for the memory and expansion, Nintendo decided to produce their own connectors in-house rather than use ones from an outside supplier. The controllers were hard-wired to the console with no connectors for cost reasons. The game pad controllers were more-or-less copied directly from the Game & Watch machines, although the Famicom design team originally wanted to use arcade-style joysticks, even taking apart ones from American game consoles to see how they worked. There were concerns regarding the durability of the joystick design and that children might step on joysticks left on the floor. Katsuyah Nakawaka attached a Game & Watch D-pad to the Famicom prototype and found that it was easy to use and caused no discomfort. Ultimately though, they installed a 15-pin expansion port on the front of the console so that an optional arcade-style joystick could be used. Uemura added an eject lever to the cartridge slot which was not really necessary, but he believed that children could be entertained by pressing it. He also added a microphone to the second controller with the idea that it could be used to make players' voices sound through the TV speaker. The console was released on July 15, 1983 as the Family Computer (or Famicom for short) for ¥14,800 (equivalent to ¥17,300 in 2013) alongside three ports of Nintendo's successful arcade games Donkey Kong, Donkey Kong Jr. and Popeye. The Famicom was slow to gather momentum; a bad chip set caused the initial release of the system to crash. Following a product recall and a reissue with a new motherboard, the Famicom's popularity soared, becoming the best-selling game console in Japan by the end of 1984. The proposed Advanced Video System bundle, including cassette drive and wireless accessories. Subsequent plans to market a Famicom console in North America featuring a keyboard, cassette data recorder, wireless joystick controller and a special BASIC cartridge under the name "Nintendo Advanced Video System" likewise never materialized. By the beginning of 1985, more than 2.5 million Famicom units had been sold in Japan, and Nintendo soon announced plans to release it in North America as the Advanced Video Entertainment System (AVS) that same year. The American video game press was skeptical that the console could have any success in the region, as the industry was still recovering from the video game crash of 1983. The March 1985 issue of Electronic Games magazine stating that "the videogame market in America has virtually disappeared" and that "this could be a miscalculation on Nintendo's part." At June 1985's Consumer Electronics Show (CES), Nintendo unveiled the American version of its Famicom, with a new case redesigned by Lance Barr and featuring a "zero insertion force" cartridge slot. The change from a top-loader in the Famicom to a front-loader was to make the new console more like a video cassette recorder, which had grown in popularity by 1985, and differentiate the unit from past video game consoles. This is the system which would eventually be officially deployed as the Nintendo Entertainment System, or the colloquial "NES". Nintendo seeded these first systems to limited American test markets starting in New York City on October 18, 1985, and following up with a full-fledged North American release in February of the following year. The nationwide release came in September 1986. Nintendo released 17 launch titles: 10-Yard Fight, Baseball, Clu Clu Land, Duck Hunt, Excitebike, Golf, Gyromite, Hogan’s Alley, Ice Climber, Kung Fu, Pinball, Soccer, Stack-Up, Tennis, Wild Gunman, Wrecking Crew, and Super Mario Bros.h[›] Some varieties of these launch games contain Famicom chips with an adapter inside the cartridge so they play on North American consoles, which is why the title screens of Gyromite and Stack-Up have the Famicom titles "Robot Gyro" and "Robot Block", respectively. R.O.B. (Robotic Operating Buddy), an accessory for the NES's 1985 launch. Although it ended up having a short product lifespan, R.O.B. was initially used to market the NES as novel and sophisticated compared to previous game consoles. The system's launch represented not only a new product, but also a reframing of the severely damaged home video game market. The 1983 video game crash had occurred in large part due to a lack of consumer and retailer confidence in video games, which had been partially due to confusion and misrepresentation in video game marketing. Prior to the NES, the packaging of many video games presented bombastic artwork which exaggerated the graphics of the actual game. In terms of product identity, a single game such as Pac-Man would appear in many versions on many different game consoles and computers, with large variations in graphics, sound, and general quality between the versions. In stark contrast, Nintendo's marketing strategy aimed to regain consumer and retailer confidence by delivering a singular platform whose technology was not in need of exaggeration and whose qualities were clearly defined. To differentiate Nintendo's new home platform from the perception of a troubled and shallow video game market still reeling from the crash, the company freshened its product nomenclature and established a strict product approval and licensing policy. The overall system was referred to as an "Entertainment System" instead of a "video game system", which was centered upon a machine called a "Control Deck" instead of a "console", and which featured software cartridges called "Game Paks" instead of "video games". This allowed Nintendo to gain more traction in selling the system in toy stores. To deter production of games which had not been licensed by Nintendo, and to prevent copying, the 10NES lockout chip system acted as a lock-and-key coupling of each Game Pak and Control Deck. The packaging of the launch lineup of NES games bore pictures of close representations of actual onscreen graphics. To reduce consumer confusion, symbols on the games' packaging clearly indicated the genre of the game. A 'seal of quality' was printed on all licensed game and accessory packaging. The initial seal stated, "This seal is your assurance that Nintendo has approved and guaranteed the quality of this product". This text was later changed to "Official Nintendo Seal of Quality". Unlike with the Famicom, Nintendo of America marketed the console primarily to children, instituting a strict policy of censoring profanity, sexual, religious, or political content. The most famous example was Lucasfilm's attempts to port the comedy-horror game Maniac Mansion to the NES, which Nintendo insisted be considerably watered down. Nintendo of America continued their censorship policy until 1994 with the advent of the Entertainment Software Rating Board system, coinciding with criticism stemming from the cuts made to the Super NES port of Mortal Kombat compared to the Sega Genesis'. 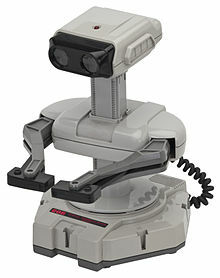 The optional Robotic Operating Buddy, or R.O.B., was part of a marketing plan to portray the NES's technology as being novel and sophisticated when compared to previous game consoles, and to portray its position as being within reach of the better established toy market. While at first, the American public exhibited limited excitement for the console itself, peripherals such as the light gun and R.O.B. attracted extensive attention. In Europe, Oceania and Canada, the system was released to two separate marketing regions. The first consisted of mainland Europe (excluding Italy) where distribution was handled by a number of different companies, with Nintendo responsible for most cartridge releases. Most of this region saw a 1986 release. The release in the Netherlands was in Q4 of 1987, where it was distributed by Bandai BV. In 1987 Mattel handled distribution for the second region, consisting of the United Kingdom, Ireland, Canada, Italy, Australia and New Zealand. Not until the 1990s did Nintendo's newly created European branch direct distribution throughout Europe. In Brazil, the console was released late in 1993 by Playtronic, even after the SNES. But the Brazilian market had been dominated by unlicensed NES clones — both locally made, and smuggled from China and Taiwan. One of the most successful local clones is the Phantom System, manufactured by Gradiente, which would end up licensing Nintendo products in the country for the following decade. The sales of officially licensed products were low, due to the cloning, the quite late official launch, and the high prices of Nintendo's licensed products. For its complete North American release, the Nintendo Entertainment System was progressively released over the ensuing years in four different bundles: the Deluxe Set, the Control Deck, the Action Set and the Power Set. The Deluxe Set, retailing at US$179.99 (equivalent to $453 in 2018), included R.O.B., a light gun called the NES Zapper, two controllers, and two Game Paks: Gyromite, and Duck Hunt. The Basic Set retailed at US$89.99 with no game, and US$99.99 bundled with the Super Mario Bros. cartridge. The Action Set, retailing in November 1988 for US$149.99, came with the Control Deck, two game controllers, an NES Zapper, and a dual Game Pak containing both Super Mario Bros. and Duck Hunt. In 1989, the Power Set included the console, two game controllers, an NES Zapper, a Power Pad, and a triple Game Pak containing Super Mario Bros, Duck Hunt, and World Class Track Meet. In 1990, a Sports Set bundle was released, including the console, an NES Satellite infrared wireless multitap adapter, four game controllers, and a dual Game Pak containing Super Spike V'Ball and Nintendo World Cup. Two more bundle packages were later released using the original model NES console. The Challenge Set of 1992 included the console, two controllers, and a Super Mario Bros. 3 Game Pak for a retail price of US$89.99. The Basic Set, first released in 1987, was repackaged for a retail US$89.99. It included only the console and two controllers, and no longer was bundled with a cartridge. Instead, it contained a book called the Official Nintendo Player's Guide, which contained detailed information for every NES game made up to that point. Finally, the console was redesigned for both the North American and Japanese markets as part of the final Nintendo-released bundle package. The package included the new style NES-101 console, and one redesigned "dogbone" game controller. Released in October 1993 in North America, this final bundle retailed for US$49.99 and remained in production until the discontinuation of the NES in 1995. On August 14, 1995, Nintendo discontinued the Nintendo Entertainment System in both North America and Europe. The Famicom was officially discontinued in September 2003. Nintendo offered repair service for the Famicom in Japan until 2007, when it was discontinued due to a shortage of available parts. Although the Japanese Famicom, North American and European NES versions included essentially the same hardware, there were certain key differences among the systems. The original Japanese Famicom was predominantly white plastic, with dark red trim. It featured a top-loading cartridge slot, grooves on both sides of the deck in which the hardwired game controllers could be placed when not in use, and a 15-pin expansion port located on the unit's front panel for accessories. The original NES, meanwhile, featured a front-loading cartridge covered by a small, hinged door that can be opened to insert or remove a cartridge and closed at other times. It features a more subdued gray, black, and red color scheme. An expansion port was found on the bottom of the unit and the cartridge connector pinout was changed. In the UK, Italy and Australia which share the PAL-A region, two versions of the NES were released; the "Mattel Version" and "NES Version". When the NES was first released in those countries, it was distributed by Mattel and Nintendo decided to use a lockout chip specific to those countries, different from the chip used in other European countries. When Nintendo took over European distribution in 1990, it produced consoles that were then labelled "NES Version"; therefore, the only differences between the two are the text on the front flap and texture on the top/bottom of the casing. The NES-101 control deck alongside its similarly redesigned NES-039 game controller. In October 1993, Nintendo redesigned the NES to follow many of the same design cues as the newly introduced Super Nintendo Entertainment System and the Japanese Super Famicom. Like the SNES, the NES-101 model loaded cartridges through a covered slot on top of the unit replacing the complicated mechanism of the earlier design. For this reason the NES-101 is known informally as the "top-loader" among Nintendo fans. The HVC-101 control deck alongside its similarly redesigned HVC-102 game controller. In December 1993, the Famicom received a similar redesign. It also loads cartridges through a covered slot on the top of the unit and uses non-hardwired controllers. Because HVC-101 used composite video output instead of being RF only like the HVC-001, Nintendo marketed the newer model as the AV Famicom. [d] Since the new controllers don't have microphones on them like the second controller on the original console, certain games such as the Disk System version of The Legend of Zelda and Raid on Bungeling Bay will have certain tricks that cannot be replicated when played on an HVC-101 Famicom without a modded controller. In October 1987, Nintendo had also released a 3D graphic capable headset called the Famicom 3D System (HVC-031). This peripheral accessory was never released outside Japan. The VCR-like loading mechanism of the NES led to problems over time. The design wore connector pins out quickly and could easily become dirty, resulting in difficulties with the NES reading game cards. When Nintendo released the NES in the US, the design styling was deliberately different from that of other game consoles. Nintendo wanted to distinguish its product from those of competitors and to avoid the generally poor reputation that game consoles had acquired following the video game crash of 1983. One result of this philosophy was to disguise the cartridge slot design as a front-loading zero insertion force (ZIF) cartridge socket, designed to resemble the front-loading mechanism of a VCR. The newly designed connector worked quite well when both the connector and the cartridges were clean and the pins on the connector were new. Unfortunately, the ZIF connector was not truly zero insertion force. When a user inserted the cartridge into the NES, the force of pressing the cartridge down and into place bent the contact pins slightly, as well as pressing the cartridge's ROM board back into the cartridge itself. Frequent insertion and removal of cartridges caused the pins to wear out from repeated usage over the years and the ZIF design proved more prone to interference by dirt and dust than an industry-standard card edge connector. These design issues were not alleviated by Nintendo's choice of materials; the console slot nickel connector springs would wear due to design and the game cartridge copper connectors were also prone to tarnishing. Many players would try to alleviate issues in the game caused by this corrosion by blowing into the cartridges, then reinserting them, which actually sped up the tarnishing. The Famicom contained no lockout hardware and, as a result, unlicensed cartridges (both legitimate and bootleg) were extremely common throughout Japan and the Far East. The original NES (but not the top-loading NES-101) contained the 10NES lockout chip, which significantly increased the challenges faced by unlicensed developers. Tinkerers at home in later years discovered that disassembling the NES and cutting the fourth pin of the lockout chip would change the chip's mode of operation from "lock" to "key", removing all effects and greatly improving the console's ability to play legal games, as well as bootlegs and converted imports. NES consoles sold in different regions had different lockout chips, so games marketed in one region would not work on consoles from another region. Known regions are: USA/Canada (3193 lockout chip), most of Europe (3195), Asia (3196) and UK, Italy and Australia (3197). Since two types of lockout chip were used in Europe, European NES game boxes often had an "A" or "B" letter on the front, indicating whether the game is compatible with UK/Italian/Australian consoles (A), or the rest of Europe (B). Rest-of-Europe games typically had text on the box stating "This game is not compatible with the Mattel or NES versions of the Nintendo Entertainment System". Similarly, UK / Italy / Australia games stated "This game is only compatible with the Mattel or NES versions of the Nintendo Entertainment System". Pirate cartridges for the NES were rare, but Famicom ones were common and widespread in Asia. Most were produced in Hong Kong or Taiwan, and they usually featured a variety of small (32k or less) games which were selected from a menu and bank switched. Some were also hacks of existing games (especially Super Mario Bros.), and a few were cartridge conversions of Famicom Disk System titles such as the Japanese Super Mario Bros. 2. Problems with the 10NES lockout chip frequently resulted in the console's most infamous problem: the blinking red power light, in which the system appears to turn itself on and off repeatedly because the 10NES would reset the console once per second. The lockout chip required constant communication with the chip in the game to work. Dirty, aging and bent connectors would often disrupt the communication, resulting in the blink effect. Alternatively, the console would turn on but only show a solid white, gray, or green screen. Users attempted to solve this problem by blowing air onto the cartridge connectors, inserting the cartridge just far enough to get the ZIF to lower, licking the edge connector, slapping the side of the system after inserting a cartridge, shifting the cartridge from side to side after insertion, pushing the ZIF up and down repeatedly, holding the ZIF down lower than it should have been, and cleaning the connectors with alcohol. These attempted solutions often became notable in their own right and are often remembered alongside the NES. Many of the most frequent attempts to fix this problem instead ran the risk of damaging the cartridge and/or system. In 1989, Nintendo released an official NES Cleaning Kit to help users clean malfunctioning cartridges and consoles. With the release of the top-loading NES-101 (NES 2) toward the end of the NES' lifespan, Nintendo resolved the problems by switching to a standard card edge connector and eliminating the lockout chip. All of the Famicom systems used standard card edge connectors, as did Nintendo's subsequent cartridge-based game consoles, the Super Nintendo Entertainment System and the Nintendo 64. In response to these hardware flaws, "Nintendo Authorized Repair Centers" sprang up across the U.S. According to Nintendo, the authorization program was designed to ensure that the machines were properly repaired. Nintendo would ship the necessary replacement parts only to shops that had enrolled in the authorization program. In practice, the authorization process consisted of nothing more than paying a fee to Nintendo for the privilege. In a recent[when?] trend, many sites have sprung up to offer Nintendo repair parts, guides, and services that replace those formerly offered by the authorized repair centers. Nintendo released a 3D headset peripheral called Famicom 3D System for 3D stereoscopic entertainment. This was never released outside Japan, since it was a commercial failure, making gamers experience headaches and nausea. Nintendo released a modem peripheral called Famicom Modem. This was not intended for children. Instead, adults would use it for gambling horse races, set stocking dates, use their bank, and more. The motherboard of the NES. The two largest chips are the Ricoh-produced CPU and PPU. For its CPU, the NES uses the Ricoh 2A03, an 8-bit microprocessor based on a MOS Technology 6502 core, running at 1.79 MHz for the NTSC NES and 1.66 MHz for the PAL version. The NES contains 2 kB of onboard work RAM. A game cartridge may contain expanded RAM to increase this amount. The size of NES games varies from 8 kB (Galaxian) to 1 MB (Metal Slader Glory), but 128 to 384 kB was the most common. The NES uses a custom-made Picture Processing Unit (PPU) developed by Ricoh. All variations of the PPU feature 2 kB of video RAM, 256 bytes of on-die "object attribute memory" (OAM) to store the positions, colors, and tile indices of up to 64 sprites on the screen, and 28 bytes of on-die palette RAM to allow selection of background and sprite colors. The console's 2 kB of onboard RAM may be used for tile maps and attributes on the NES board and 8 kB of tile pattern ROM or RAM may be included on a cartridge. The system has an available color palette of 48 colors and 6 grays. Up to 25 simultaneous colors may be used without writing new values mid-frame: a background color, four sets of three tile colors and four sets of three sprite colors. The NES palette is based on NTSC rather than RGB values. A total of 64 sprites may be displayed onscreen at a given time without reloading sprites mid-screen. The standard display resolution of the NES is 256 horizontal pixels by 240 vertical pixels. Video output connections varied from one model of the console to the next. The original HVC-001 model of the Family Computer featured only radio frequency (RF) modulator output. When the console was released in North America and Europe, support for composite video through RCA connectors was added in addition to the RF modulator. The HVC-101 model of the Famicom dropped the RF modulator entirely and adopted composite video output via a proprietary 12-pin "multi-out" connector first introduced for the Super Famicom/Super Nintendo Entertainment System. Conversely, the North American re-released NES-101 model most closely resembled the original HVC-001 model Famicom, in that it featured RF modulator output only. Finally, the PlayChoice-10 utilized an inverted RGB video output. The stock NES supports a total of five sound channels, two of which are pulse channels with 4 pulse width settings, one is a triangle wave generator, another is a noise generator (often used for percussion), and the 5th one plays low-quality digital samples. The NES supports expansion chips contained in certain cartridges to add sound channels and help with data processing. Developers can add these chips to their games, such as the Konami VRC6, Konami VRC7, Sunsoft 5B, Namco 163, and two more by Nintendo itself: the Nintendo FDS wave generator (a modified Ricoh RP2C33 chip with single-cycle wave table-lookup sound support), and the Nintendo Memory Management Controller 5 (MMC5). Due to wiring differences between the Famicom and NES, a stock NES console is incapable of passing through audio generated by expansion chips utilizing additional sound channels, but can be modified to regain this capability. In addition to featuring a revised color scheme that matched the more subdued tones of the console itself, NES controllers could be unplugged. However, the NES controllers lacked the microphone featured in Famicom controllers. The game controller used for both the NES and the Famicom featured an oblong brick-like design with a simple four button layout: two round buttons labeled "A" and "B", a "START" button and a "SELECT" button. Additionally, the controllers utilized the cross-shaped joypad, designed by Nintendo employee Gunpei Yokoi for Nintendo Game & Watch systems, to replace the bulkier joysticks on earlier gaming consoles’ controllers. Instead of the Famicom's hardwired controllers, the NES features two custom 7-pin ports on the front of the console to support swappable and potentially third-party controllers. The controllers bundled with the NES are identical and include the START and SELECT buttons, allowing some NES versions of games, such as The Legend of Zelda, to use the START button on the second controller to save the game at any time. The NES controllers lack the microphone, which is used on the Famicom version of Zelda to kill certain enemies, or for singing with karaoke games. A number of special controllers were designed for use with specific games, though were not very popular. Such devices include the Zapper light gun, the R.O.B., and the Power Pad. The original Famicom features a deepened DA-15 expansion port on the front of the unit, which is used to connect most auxiliary devices. On the NES, these special controllers are generally connected to one of the two control ports on the front of the console. Nintendo made two advanced controllers for the NES called NES Advantage and the NES Max. Both controllers have a Turbo feature, where one press of the button represents multiple automatic rapid presses. This feature allows players to shoot much faster in shooter games. The NES Advantage has two knobs that adjust the firing rate of the turbo button from quick to Turbo, as well as a "Slow" button that slows down compatible games by rapidly pausing the game. The NES Max has a non-adjustable Turbo feature and no "Slow" feature, and has a wing-like handheld shape and a sleek directional pad. Turbo functionality exists on the NES Satellite, the NES Four Score, and the U-Force. Other accessories include the Power Pad and the Power Glove, which is featured in the movie The Wizard. Near the end of the NES's lifespan, upon the release of the AV Famicom and the top-loading NES 2, the design of the game controllers was modified slightly. Though the original button layout was retained, the controller's shape resembles that of the SNES's controller. In addition, the AV Famicom dropped the hardwired controllers in favor of detachable controller ports. The controllers included with the Famicom AV have 90 cm (3 feet) long cables, compared to the 180 cm (6 feet) of NES controllers. 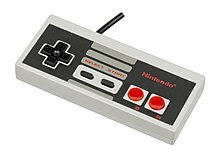 The original NES controller has become one of the most recognizable symbols of the console. Nintendo has mimicked the look of the controller in several other products, from promotional merchandise to limited edition versions of the Game Boy Advance. The Japanese Famicom has BASIC support with the Family BASIC keyboard. A number of peripheral devices and software packages were released for the Famicom. Few of these devices were ever released outside Japan. Family BASIC is an implementation of BASIC for the Famicom, packaged with a keyboard. Similar in concept to the Atari 2600 BASIC cartridge, it allows the user to program their own games, which can be saved on an included cassette recorder. Nintendo of America rejected releasing Famicom BASIC in the US because it did not think it fit their primary marketing demographic of children. The Famicom Modem connected a Famicom to a now defunct proprietary network in Japan which provided content such as financial services. A dialup modem was never released for NES. The Disk System was a peripheral available only for the Japanese Famicom that used games stored on "Disk Cards" with a 3" Quick Disk mechanism. In 1986, Nintendo released the Famicom Disk System (FDS) in Japan, a type of floppy drive that uses a single-sided, proprietary 5 cm (2") disk and plugs into the cartridge port. It contains RAM for the game to load into and an extra single-cycle wavetable-lookup sound chip. The disks were originally obtained from kiosks in malls and other public places where buyers could select a title and have it written to the disk. This process would cost less than cartridges and users could take the disk back to a vending booth and have it rewritten with a new game. The disks were used both for storing the game and saving progress and total capacity was 128k (64k per side). A variety of games for the FDS were released by Nintendo (including some which had already been released on cartridge, such as Super Mario Bros.) and third party companies such as Konami and Taito. A few unlicensed titles were made as well. Its limitations became quickly apparent as larger ROM chips were introduced, allowing cartridges with greater than 128k of space. More advanced memory management chips (MMC) soon appeared and the FDS quickly became obsolete. Nintendo also charged developers considerable amounts of money to produce FDS games, and many refused to develop for it, instead continuing to make cartridge titles. Many FDS disks have no dust covers (except in some unlicensed and bootleg variants) and are easily prone to getting dirt on the media. In addition, the drive uses a belt which breaks frequently and requires invasive replacement. After only two years, the FDS was discontinued, although vending booths remained in place until 1993 and Nintendo continued to service drives, and to rewrite and offer replacement disks until 2003. Nintendo did not release the Disk System outside Japan due to numerous problems encountered with the medium in Japan, and due to the increasing data storage capacity and reducing cost of the highly reliable cartridge medium. As a result, many Disk System games such as Castlevania, The Legend of Zelda, and Bubble Bobble were converted to cartridge format for their export releases, resulting in simplified sound and the disk save function replaced by passwords or battery save systems. Pirated clones of NES hardware remained in production for many years after the original had been discontinued. Some clones play cartridges from multiple systems, such as this FC Twin that plays NES and SNES games. A thriving market of unlicensed NES hardware clones emerged during the climax of the console's popularity. Initially, such clones were popular in markets where Nintendo never issued a legitimate version of the console. In particular, the Dendy (Russian: Де́нди), an unlicensed hardware clone produced in Taiwan and sold in the former Soviet Union, emerged as the most popular video game console of its time in that setting and it enjoyed a degree of fame roughly equivalent to that experienced by the NES/Famicom in North America and Japan. A range of Famicom clones was marketed in Argentina during the late 1980s and early 1990s under the name of "Family Game", resembling the original hardware design. The Micro Genius (Simplified Chinese: 小天才) was marketed in Southeast Asia as an alternative to the Famicom; Samurai was the popular PAL alternative to the NES; and in Central Europe, especially Poland, the Pegasus was available. 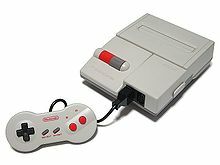 Since 1989, there were many Brazilian clones of NES, and the very popular Phantom System (with hardware superior to the original console) caught the attention of Nintendo itself. The RetroUSB AVS, an FPGA-based hardware clone of the NES that outputs 720p via HDMI. The unlicensed clone market has flourished following Nintendo's discontinuation of the NES. Some of the more exotic of these resulting systems have gone beyond the functionality of the original hardware and have included variations such as a portable system with a color LCD (e.g. PocketFami). Others have been produced with certain specialized markets in mind, such as an NES clone that functions as a rather primitive personal computer, which includes a keyboard and basic word processing software. These unauthorized clones have been helped by the invention of the so-called NES-on-a-chip. As was the case with unlicensed software titles, Nintendo has typically gone to the courts to prohibit the manufacture and sale of unlicensed cloned hardware. Many of the clone vendors have included built-in copies of licensed Nintendo software, which constitutes copyright infringement in most countries. Although most hardware clones were not produced under license by Nintendo, certain companies were granted licenses to produce NES-compatible devices. The Sharp Corporation produced at least two such clones: the Twin Famicom and the SHARP 19SC111 television. The Twin Famicom was compatible with both Famicom cartridges and Famicom Disk System disks. It was available in two colors (red and black) and used hardwired controllers (as did the original Famicom), but it featured a different case design. The SHARP 19SC111 television was a television which included a built-in Famicom. A similar licensing deal was reached with Hyundai Electronics, who licensed the system under the name Comboy in the South Korean market. This deal with Hyundai was made necessary because of the South Korean government's wide ban on all Japanese "cultural products", which remained in effect until 1998 and ensured that the only way Japanese products could legally enter the South Korean market was through licensing to a third-party (non-Japanese) distributor (see also Japan–Korea disputes). In India, the system was sold under the name Samurai and assembled locally under license from kits due to policies that banned imports of electronics. The NES Test station (Lower Left), SNES counter tester (Lower Right), SNES test cart (Upper Right), And the original TV that came with the unit (Upper Left). The NES Test Station was a diagnostics machine for the Nintendo Entertainment System introduced in 1988. It was a NES-based unit designed for testing NES hardware, components and games. It was only provided for use in World of Nintendo boutiques as part of the Nintendo World Class Service program. Visitors were to bring items to test with the station, and could be assisted by a store technician or employee. The NES Test Station's front features a Game Pak slot and connectors for testing various components (AC adapter, RF switch, Audio/Video cable, NES Control Deck, accessories and games), with a centrally-located selector knob to choose which component to test. The unit itself weighs approximately 11.7 pounds without a TV. It connects to a television via a combined A/V and RF Switch cable. By actuating the green button, a user can toggle between an A/V Cable or RF Switch connection. The television it is connected to (typically 11" to 14") is meant to be placed atop it. NES test station AC adapter Pass or Fail test demonstration. Upon connecting an RF, AV, or AC adapter to the test station, the system displays a 'Pass' or 'Fail' result. There was a manual included with the test station to help the user understand how to use the equipment, or how to make repairs. The manual came in a black binder with a Nintendo World Class Service logo on the front. In 1991, Nintendo provided an add-on called the "Super NES Counter Tester" that tests Super Nintendo components and games. The SNES Counter Tester is a standard SNES on a metal fixture with the connection from the back of the SNES re-routed to the front of the unit. These connections may be made directly to the test station or to the TV, depending on what is to be tested. The Nintendo Entertainment System offered a number of groundbreaking titles. Super Mario Bros. pioneered side-scrollers while The Legend of Zelda helped popularize battery-backed save functionality. North American and PAL NES cartridges (or "Game Paks") are significantly larger than Japanese Famicom cartridges. The NES uses a 72-pin design, as compared with 60 pins on the Famicom. To reduce costs and inventory, some early games released in North America were simply Famicom cartridges attached to an adapter to fit inside the NES hardware. Originally, NES cartridges were held together with five small slotted screws. Games released after 1987 were redesigned slightly to incorporate two plastic clips molded into the plastic itself, removing the need for the top two screws. The back of the cartridge bears a label with handling instructions. Production and software revision codes were imprinted as stamps on the back label to correspond with the software version and producer. All licensed NTSC and PAL cartridges are a standard shade of gray plastic, with the exception of The Legend of Zelda and Zelda II: The Adventure of Link, which were manufactured in gold-plastic carts. Unlicensed carts were produced in black, robin egg blue, and gold, and are all slightly different shapes than standard NES cartridges. Nintendo also produced yellow-plastic carts for internal use at Nintendo Service Centers, although these "test carts" were never made available for purchase. All licensed US cartridges were made by Nintendo, Konami and Acclaim. For promotion of DuckTales: Remastered, Capcom sent 150 limited-edition gold NES cartridges with the original game, featuring the Remastered art as the sticker, to different gaming news agencies. The instruction label on the back included the opening lyric from the show's theme song, "Life is like a hurricane". Japanese (Famicom) cartridges are shaped slightly differently. Unlike NES games, official Famicom cartridges were produced in many colors of plastic. Adapters, similar in design to the popular accessory Game Genie, are available that allow Famicom games to be played on an NES. In Japan, several companies manufactured the cartridges for the Famicom. This allowed these companies to develop their own customized chips designed for specific purposes, such as chips that increased the quality of sound in their games. The Famicom Family mark started appearing in games and peripherals released from 1988 and onward that were approved by Nintendo for compatibility with official Famicom consoles and derivatives. Nintendo's near monopoly on the home video game market left it with a degree of influence over the industry. Unlike Atari, which never actively courted third-party developers (and even went to court in an attempt to force Activision to cease production of Atari 2600 games), Nintendo had anticipated and encouraged the involvement of third-party software developers; strictly on Nintendo's terms. Some of the Nintendo platform-control measures were adopted by later console manufacturers such as Sega, Sony, and Microsoft, although not as stringent. To this end, a 10NES authentication chip was placed in every console and another was placed in every officially licensed cartridge. If the console's chip could not detect a counterpart chip inside the cartridge, the game would not load. Nintendo portrayed these measures as intended to protect the public against poor-quality games, and placed a golden seal of approval on all licensed games released for the system. Nintendo was not as restrictive as Sega, which did not permit third-party publishing until Mediagenic in late summer 1988. Nintendo's intention was to reserve a large part of NES game revenue for itself. Nintendo required that it be the sole manufacturer of all cartridges, and that the publisher had to pay in full before the cartridges for that game be produced. Cartridges could not be returned to Nintendo, so publishers assumed all the risk. As a result, some publishers lost more money due to distress sales of remaining inventory at the end of the NES era than they ever earned in profits from sales of the games. Because Nintendo controlled the production of all cartridges, it was able to enforce strict rules on its third-party developers, which were required to sign a contract by Nintendo that would obligate these parties to develop exclusively for the system, order at least 10,000 cartridges, and only make five games per year. A 1988 shortage of DRAM and ROM chips also reportedly caused Nintendo to only permit 25% of publishers' requests for cartridges. This was an average figure, with some publishers receiving much higher amounts and others almost none. GameSpy noted that Nintendo's "iron-clad terms" made the company many enemies during the 1980s. Some developers tried to circumvent the five game limit by creating additional company brands like Konami's Ultra Games label; others tried circumventing the 10NES chip. Nintendo was accused of antitrust behavior because of the strict licensing requirements. The United States Department of Justice and several states began probing Nintendo's business practices, leading to the involvement of Congress and the Federal Trade Commission (FTC). The FTC conducted an extensive investigation which included interviewing hundreds of retailers. During the FTC probe, Nintendo changed the terms of its publisher licensing agreements to eliminate the two-year rule and other restrictive terms. Nintendo and the FTC settled the case in April 1991, with Nintendo required to send vouchers giving a $5 discount off to a new game, to every person that had purchased a NES title between June 1988 and December 1990. GameSpy remarked that Nintendo's punishment was particularly weak giving the case's findings, although it has been speculated that the FTC did not want to damage the video game industry in the United States. With the NES near its end of its life many third-party publishers such as Electronic Arts supported upstart competing consoles with less strict licensing terms such as the Sega Genesis and then the PlayStation, which eroded and then took over Nintendo's dominance in the home console market, respectively. Consoles from Nintendo's rivals in the post-SNES era had always enjoyed much stronger third-party support than Nintendo, which relied more heavily on first-party games. Companies that refused to pay the licensing fee or were rejected by Nintendo found ways to circumvent the console's authentication system. Most of these companies created circuits that used a voltage spike to temporarily disable the 10NES chip. A few unlicensed games released in Europe and Australia came in the form of a dongle to connect to a licensed game, in order to use the licensed game's 10NES chip for authentication. To combat unlicensed games, Nintendo of America threatened retailers who sold them with losing their supply of licensed titles and multiple revisions were made to the NES PCBs to prevent unlicensed games from working. Atari Games took a different approach with its line of NES products, Tengen. The company attempted to reverse engineer the lockout chip to develop its own "Rabbit" chip. Tengen also obtained a description of the lockout chip from the United States Patent and Trademark Office by falsely claiming that it was required to defend against present infringement claims. Nintendo successfully sued Tengen for copyright infringement. Tengen's antitrust claims against Nintendo were never decided. Color Dreams made Christian video games under the subsidiary name Wisdom Tree. It was never sued by Nintendo as the company probably feared a public relations backlash. As the Nintendo Entertainment System grew in popularity and entered millions of American homes, some small video rental shops began buying their own copies of NES games, and renting them out to customers for around the same price as a video cassette rental for a few days. Nintendo received no profit from the practice beyond the initial cost of their game, and unlike movie rentals, a newly released game could hit store shelves and be available for rent on the same day. Nintendo took steps to stop game rentals, but didn't take any formal legal action until Blockbuster Video began to make game rentals a large-scale service. Nintendo claimed that allowing customers to rent games would significantly hurt sales and drive up the cost of games. Nintendo lost the lawsuit, but did win on a claim of copyright infringement. Blockbuster was banned from including original, copyrighted instruction booklets with their rented games. In compliance with the ruling, Blockbuster produced their own short instructions—usually in the form of a small booklet, card, or label stuck on the back of the rental box—that explained the game's basic premise and controls. Video rental shops continued the practice of renting video games and still do today. There were some risks with renting cartridge-based games. Most rental shops did not clean the connectors and they would become dirty over time. Renting and using a cartridge with dirty connectors posed a problem for consoles, especially the Nintendo Entertainment System which was particularly susceptible to operation problems and failures when its internal connectors became dirty (see the Design flaws section below). By 1988, industry observers stated that the NES's popularity had grown so quickly that the market for Nintendo cartridges was larger than that for all home computer software. Compute! reported in 1989 that Nintendo had sold seven million NES systems in 1988 alone, almost as many as the number of Commodore 64s sold in its first five years. "Computer game makers [are] scared stiff", the magazine said, stating that Nintendo's popularity caused most competitors to have poor sales during the previous Christmas and resulted in serious financial problems for some. In June 1989, Nintendo of America's vice president of marketing Peter Main, said that the Famicom was present in 37% of Japan's households. By 1990, 30% of American households owned the NES, compared to 23% for all personal computers. By 1990, the NES had outsold all previously released consoles worldwide. [better source needed] The slogan for this brand was It can't be beaten. In Europe and South America, the NES was outsold by Sega's Master System, while the Nintendo Entertainment System was not available in the Soviet Union. As the 1990s dawned, gamers predicted that competition from technologically superior systems such as the 16-bit Sega Mega Drive/Genesis would mean the immediate end of the NES's dominance. Instead, during the first year of Nintendo's successor console the Super Famicom (named Super Nintendo Entertainment System outside Japan), the Famicom remained the second highest-selling video game console in Japan, outselling the newer and more powerful NEC PC Engine and Sega Mega Drive by a wide margin. The console remained popular in Japan and North America until late 1993, when the demand for new NES software abruptly plummeted. The final Famicom game released in Japan is Takahashi Meijin no Bōken Jima IV (Adventure Island IV), while in North America, Wario's Woods is the final licensed game. The last game to be released in Europe was The Lion King in 1995. In the wake of ever decreasing sales and the lack of new software titles, Nintendo of America officially discontinued the NES by 1995. Nintendo kept producing new Famicom units in Japan until September 25, 2003, and continued to repair Famicom consoles until October 31, 2007, attributing the discontinuation of support to insufficient supplies of parts. The NES was released after the "video game crash" of the early 1980s, when many retailers and adults regarded electronic games as a passing fad, so many believed at first that the NES would soon fade. Before the NES/Famicom, Nintendo was known as a moderately successful Japanese toy and playing card manufacturer, but the popularity of the NES/Famicom helped the company grow into an internationally recognized name almost synonymous with video games as Atari had been, and set the stage for Japanese dominance of the video game industry. With the NES, Nintendo also changed the relationship between console manufacturers and third-party software developers by restricting developers from publishing and distributing software without licensed approval. This led to higher quality software titles, which helped change the attitude of a public that had grown weary from poorly produced titles for earlier game systems. The NES hardware was also very influential. Nintendo chose the name "Nintendo Entertainment System" for the US market and redesigned the system so it would not give the appearance of a child's toy. The front-loading cartridge input allowed it to be used more easily in a TV stand with other entertainment devices, such as a videocassette recorder. The system's hardware limitations led to design principles that still influence the development of modern video games. Many prominent game franchises originated on the NES, including Nintendo's own Super Mario Bros., The Legend of Zelda and Metroid, Capcom's Mega Man franchise, Konami's Castlevania franchise, Square's Final Fantasy, and Enix's Dragon Quest franchises. NES imagery, especially its controller, has become a popular motif for a variety of products, including Nintendo's own Game Boy Advance. Clothing, accessories, and food items adorned with NES-themed imagery are still produced and sold in stores. The NES can be emulated on many other systems, most notably the PC. The first emulator was the Japanese-only Pasofami. It was soon followed by iNES, which was available in English and was cross-platform, in 1996. It was described as being the first NES emulation software that could be used by a non-expert. NESticle, a popular MS-DOS emulator, was released on April 3, 1997. There have since been many other emulators. The Virtual Console for the Wii, Nintendo 3DS and Wii U also offers emulation of many NES games. In 2018, Nintendo added NES games to be playable on the Nintendo Switch via its Nintendo Switch Online service, with an initial offering of 20 games with continued releases after launch. The emulator is capable of hosting and playing multiplayer titles online, in addition to local multiplayer. Replicas of the NES controllers for exclusive use with the Nintendo Switch are available for Switch Online subscribers. On July 14, 2016, Nintendo announced the November 2016 launch of a miniature replica of the NES, titled Nintendo Entertainment System: NES Classic Edition in the United States and Nintendo Classic Mini: Nintendo Entertainment System in Europe and Australia. The console includes 30 permanently inbuilt games from the vintage NES library, including the Super Mario Bros. and The Legend of Zelda series. The system features HDMI display output and a new replica controller, which can also connect to the Wii Remote for use with Virtual Console games. It was discontinued in North America on April 13, 2017, and worldwide on April 15, 2017. However, Nintendo announced in September 2017 that the NES Classic Mini would return to production on June 29, 2018. This page is based on the Wikipedia article Nintendo Entertainment System; it is used under the Creative Commons Attribution-ShareAlike 3.0 Unported License (CC-BY-SA). You may redistribute it, verbatim or modified, providing that you comply with the terms of the CC-BY-SA.